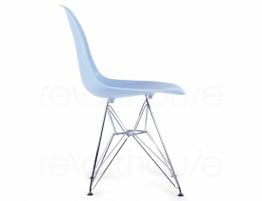 The Relax House designer replica Eames Eiffel side chair in blue pays tribute to an absolutely iconic designer chair. Put this gorgeous designer chair around your modern dining table, your desk or workspace, your art room, your guest room. This designer chair will elevate your surroundings wherever you put it. 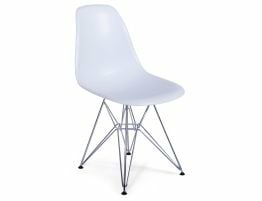 In creating these modern classics, Charles and Ray Eames honed two techniques with which they had been struggling with for years, a sculpted plastic shell seat and the use of a bent and welded wire base. 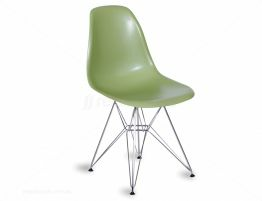 The Eames group of moulded chairs, commonly referred to as Eiffel chairs, were the first industrially manufactured plastic chairs. The design husband and wife team also sought to create functional art that was widely available and affordable. 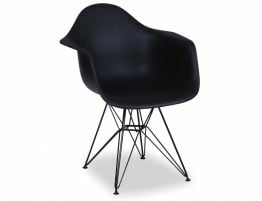 Like many other designers of the time involved in industrial design innovation, the Eames understood the importance of high quality design pieces at low prices. 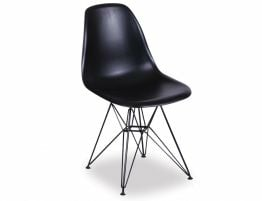 This beautiful, true to form reproduction designer chair adds a decidedly modern flair to your interior space. 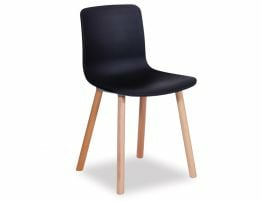 These good looking chairs would also be a beautiful addition to the dining room of your restaurant or café. 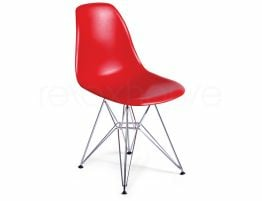 These chairs are instantly recognizable by anyone who knows a bit about mid century modern design. With our designer replica, you can have the same upscale look at a fraction of the price of an original. People will wonder how you got the real thing, we’ll never tell!